Columbia-led discovery in mice aids efforts to map the circuitry of the brain’s learning center; stands to inform studies of psychiatric disorders in which this circuitry goes awry. 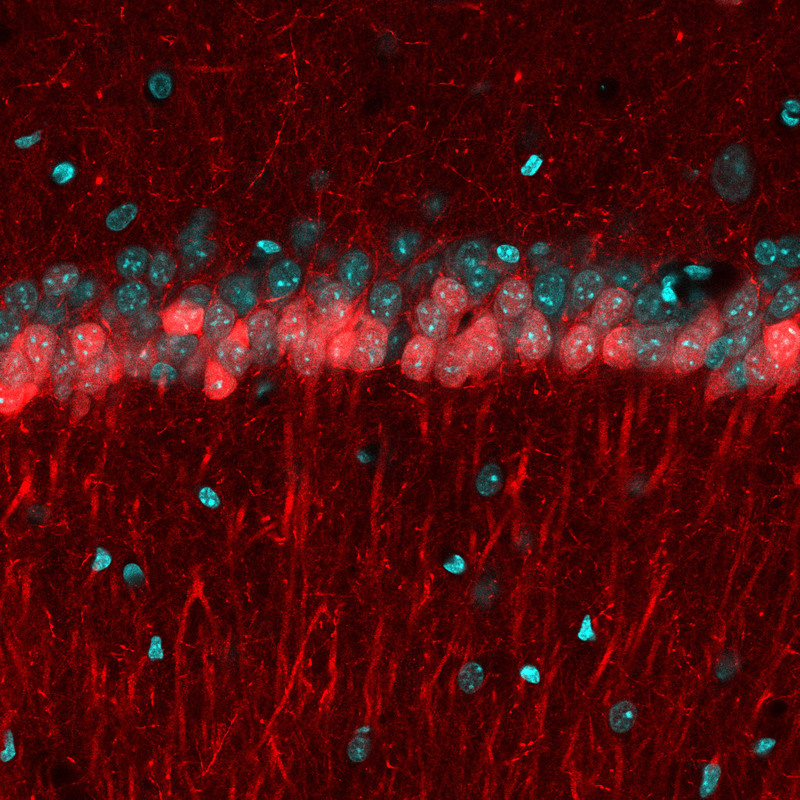 Image of the mouse hippocampus. 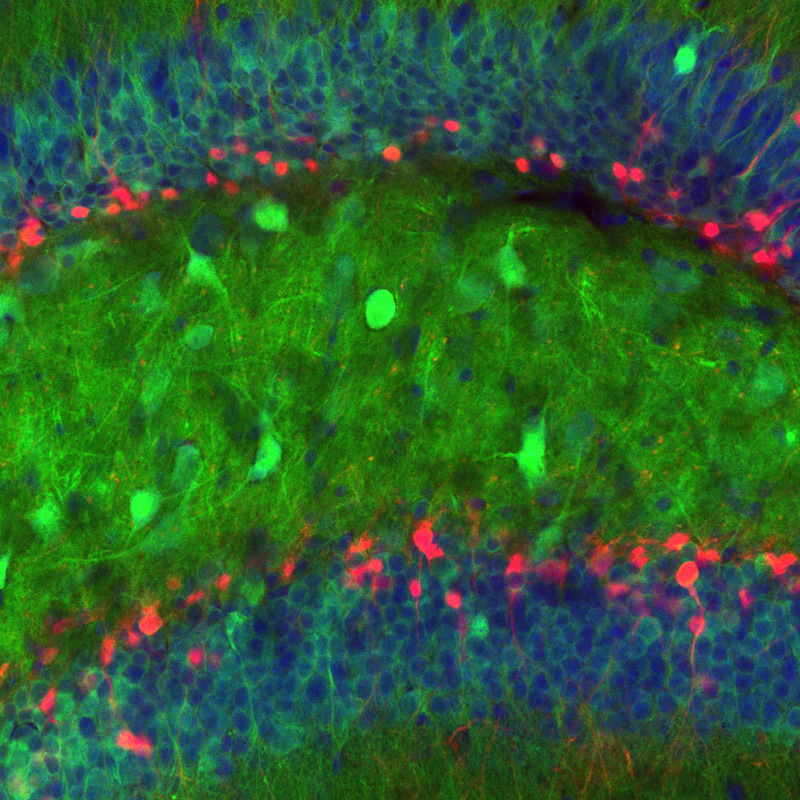 VIP interneurons are labeled red while other neurons innervating VIP cells are labeled green (Credit: Losonczy lab/Columbia's Zuckerman Institute). From the cab driver heading for Times Square to the commuter returning home on the freeway, we all carry maps in our head labeled with important locations. And a new Columbia study in mice shows that, by directing the delicate ebb-and-flow of brain activity, a small cluster of cells helps the brain’s internal GPS remember which places matter most. These findings underscore the fact that navigating an environment requires flexibility in the brain: brain-cell activity must change as memories are formed or recalled. This research, published today in Neuron, could also provide insight into psychiatric disorders, such as autism and schizophrenia, which are often characterized by disruptions to this flexibility. Our work, and the work of others, could very well help to elucidate how these disruptions result in these disorders’ devastating symptoms. The brain’s headquarters for learning and memory is the hippocampus, and it can be divided into distinct areas that process memory-related information. For this study, the researchers focused on area CA1, which encodes an animal’s location — as discovered by researchers who won the 2014 Nobel Prize. In 2016, Dr. Losonczy’s lab found that CA1 neurons can act like a homing beacon; when a mouse looked for something, like water, neural activity spiked as the animal got close. “The question then became: Was something directing this spike in activity?” said Dr. Losonczy, who is also a professor of neuroscience at Columbia’s Vagelos College of Physicians and Surgeons. Broadly speaking, scientists divide neurons into two types: excitatory and inhibitory. Excitatory neurons are the gas pedal; they drive the activity of other neurons. Inhibitory neurons, by contrast, are the brakes: they suppress neural activity. Today’s study focused on a particular type of CA1 inhibitory neurons called vasoactive intestinal polypeptide-expressing, or VIP, cells. Researchers had previously confirmed the existence of VIP cells, but had not examined them in the hippocampus of animals as they learned. 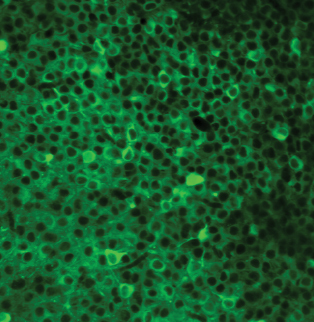 Using a two-photon microscope, Dr. Losonczy and his team monitored the VIP-cell activity as the mice ran on treadmills laden with various sights and sounds, some familiar and others new. This allowed the researchers to examine how the animals’ brains responded as they explored their surroundings, without a particular goal in mind. In second set of experiments, the mice were given a task: find a water reward that had been placed at a specific, unmarked location along the treadmill’s path. VIP-cell activity tended to spike during both sets of experiments: first as the animal ran aimlessly and then during goal-oriented learning when it sought the reward. Additional experiments and computational modeling, undertaken in collaboration with co-senior author Panayiota Poirazi, PhD, revealed how VIP cells heavily influenced CA1 neural activity. In a sequence of Rube Goldberg machine-like steps, the VIP cells first targeted the cluster of inhibitory neurons, effectively silencing them. “With the inhibitory neurons no longer suppressing their activity, the excitatory neurons were then free to switch on,” said Dr. Losonczy. “This set off a chain reaction; activating the entire CA1 memory circuit and, ultimately, allowing the animals to learn. As a reflection of this stepwise mechanism, Dr. Losonczy classifies VIP cells as disinhibitory neurons, because they act by inhibiting the inhibitory neurons. Disinhibition thus appears to be an ingenious way in which excitatory neurons can — in a roundabout way — be activated. Though disinhibition may seem counterintuitive, Dr. Losonczy argues that it is actually illustrative of the delicate and fine-tuned nature of learning. A simple circuit — with one on-off switch — would be too blunt. An added layer of complexity may have evolved to match the complex nature of memory. This complexity also gives the circuit added flexibility when choosing which groups of neurons get activated, thus providing an additional, subtle way of adjusting itself during learning. Moving forward, the research team will continue investigating VIP cells, as well as other cell types in the hippocampus involved in learning. They are also optimistic about what these findings mean for understanding disorders in which disrupted neural circuitry has been implicated. This paper is titled “Vasoactive intestinal polypeptide-expressing interneurons in the hippocampus support goal-oriented spatial learning.” Additional contributors include co-first authors Gergely Farkas Turi, PhD, and Wen-Ke Li, PhD, Spyridon Chavlis, Ioanna Pandi, Justin O’Hare, PhD, James Benjamin Priestley, Andres Daniel Grosmark, PhD, Zhenrui Liao, Max Ladow, Jeffrey Fang Zhang and Boris Valery Zemelman. This research was supported by the National Institute of Mental Health (1R01MH100631, 1U19NS104590, 1R01NS094668, F32MH18716, U01NS094330, U01NS099720), the Zegar Family Foundation, New York State Stem Cell Science (NYSTEM-C029157, S10OD0184464), the Revson Foundation and the ERC Starting Grant dEMORY (ERC-2012-StG-311435). Vasoactive Intestinal Polypeptide-Expressing Interneurons in the Hippocampus Support Goal-Oriented Spatial Learning.